Cycle the trails, bike lanes, and quieter streets of DC as you explore iconic sites, monuments, and museums on this private 3-hour bike tour! Your private guide is a locally and nationally known cycling expert, professional guide, and knowledgable historian who will customize the ride to fit your exact preferences. 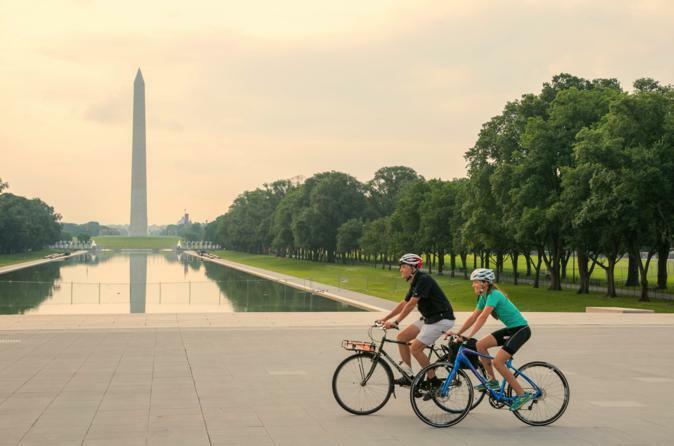 Exploring DC’s iconic sights, monuments and museums is best done by bike! Cycle the streets of the nation's capital with a nationally known cycling expert and professional guide on this private 3-hour tour. Your guide will bring the stories of the sights to life while escorting you through the best routes in the city, allowing you to ride and enjoy the city's sights safely. The tour begins at your hotel or local accommodations, where your guide will meet you. Visit sights like the White House, Washington Monument, Smithsonian Castle, Jefferson Memorial, Dr. Martin Luther King Jr. Memorial, World War II Memorial, Vietnam Veterans Memorial, Korean Veterans Memorial, and Lincoln Memorial. Your ride may also be customized further to see particular sights, neighborhoods, or trails as you wish. You might opt to visit the U.S. Capitol Building, Supreme Court, Library of Congress, Capitol Hill, Eastern Market, Navy Yard and Yard’s Park, The Wharf, Georgetown, Watergate, Kennedy Center, Franklin Delano Roosevelt Memorial, Washington Fish Market, Marine Corps War Memorial (Iwo Jima Memorial), Arlington National Cemetery, the Titanic Memorial or a multitude of other sights throughout the capital. Your private tour itinerary is flexible, and will provide ample opportunities to stop and explore any sight you choose. Each member of your group will receive a premium water bottle to keep, and you'll have your choice of the best snacks along the ride. Your personal tour guide will carry some (if not all) of your gear, allowing you to relax as you ride and enjoy the scenery. Your 3-hour tour ends with a guided loop back to your pickup location. (or wherever you wish to finish your ride).